We manufacture chains as per all the international standards – ANSI, BS and DIN. 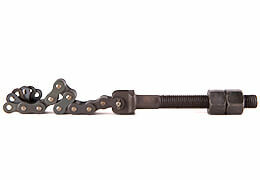 These chains are used in the Material Handling Industry. We are one among the leading suppliers to Global OEMs in this segment. The BL series leaf chains are designed for medium loads and greater shocks for applications in lift trucks, masts, construction and mining. The AL series of Leaf Chains are used for light duty applications with relatively constant, low loads.